Gaining knowledge about how to maintain your health is a vital part of enjoying the highest levels of well-being. The Van Every Family Chiropractic Center team offers various events throughout the year to help you learn about maintaining your wellness. Some events happen every year, or multiple times every year, such as our Easter Bunny and Santa Visits, Fall Festival, Kids’ Club, and Bring a Friend Days. Van Every Family Chiropractic Center also has Open House weeks, Testimonial Week and many other short, one-day events throughout the year. We appreciate all of our patients and continue to find ways in which we can celebrate them. Our focus is health, education and happiness. It’s a winning combination. Interested in learning more about upcoming events at Van Every Family Chiropractic Center? Reach out to our team to get started! Join Us Thursday, April 25th for Bring a Friend Day! Twice per year, Van Every Family Chiropractic Center celebrates Bring a Friend Day. These days enable our patients to have a friend or family member visit our office. They are involved with Van Every Family Chiropractic Center and experiencing the wonderful results that KST provides. This gives their friend or family member an opportunity to find out for themselves. Visitors receive a complimentary chiropractic exam and a consultation with one of our doctors. Most become patients, even the doubtful ones, simply because they get their questions answered. Join Us May 18th 2019 For Our Annual Kids Day! is hosting our Annual Royal Oak Kid’s Day Event! Royal Oak Kid’s Day is a free health and safety event for the children in surrounding communities. The focus is on healthy families and child safety but presented in a Fun, Festive environment. We offer free Child ID kits, Bicycle Helmets for $5, Health Screenings, Posture Screenings and much more. The Royal Oak Police Department & Fire Department will be on hand with their vehicles. Kids can have their faces painted, crazy hair, tattoos, bounce in huge bouncy castles and dance to our favorite DJ spinning some great tunes! 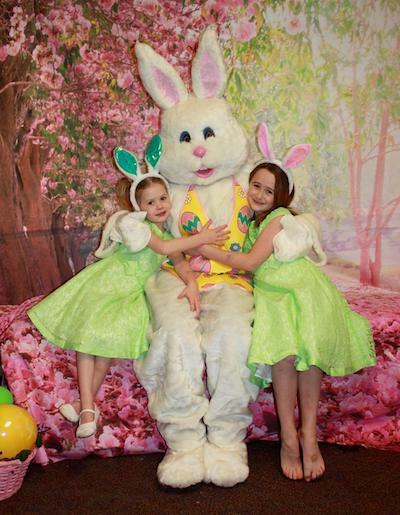 Kids are invited to visit with the Easter Bunny and Santa right here in our office. The family receives a free 5 x 7 photo of the visit. This is simply an excuse to have a fun day at Van Every Family Chiropractic Center, and something that many families look forward to every year. So many adorable pictures! One Friday a month, Van Every celebrates our youngest patients by offering Kid’s Club. Parents can bring their kids under 17 yrs old and have them adjusted. Kids get balloons and popcorn while parents get peace of mind! Please call us for upcoming dates. Each October our patients and their families are invited to enjoy our Fall Festival. Everyone receives a free pumpkin and can win prizes at any of our fun games. We have cider and donuts, too. Our DJ is here spinning the hits and keeping everyone dancing. Staff and guests get to dress up in their Halloween finest! Our goal is to make it so much fun that the kids don’t even realize they’re learning good health habits!